AKITA-The head of a bear, the heart of a lion, the agility of a cat-all marks of the Henke akitas. For over twenty years we have bred and raised an outstanding Akita adhering to the ideal Akita standard. Ours are the American type with bear head, super loving companion, and happy personalities. As the American type, they are heavy boned, weighing from 90-150 lbs. We have several colors depending on the particular lineage. We have the red/fawn with the black mask and white markings, the silver/black with black mask and some white markings, and lastly, the pinto. We have several litter a year. We offer a health guarantee for our big, fuzzy teddy bear pups. 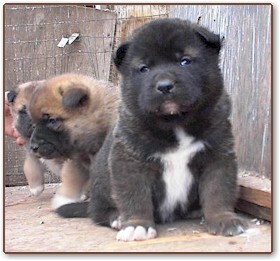 If you are interested in a happy, loving companion, these Akita pups will be all you could ask for. For the serious show/breeder, we offer the finest of any litter. Prices start at $600 for pets and $800 for show/breeder. Bloodlines contain the following: Toshiro Go, Remwood Soshi Motto, Oshio's Do To Go, Big O's Thunder of Larae, Kiri Yama Gunson of Suomi, Big Benz Tokashi Spellbinder, Showman's Jakura of GW. Jube's Aki Tesu's Shokin, MeadowCreek's Ky Prince, Subo's Beejay of Hillsides, Kenjiko Royal Tenji, Nan Chao's Samurai No Chenko, Migoto's Wonder Women, OBJ's High N Mighty Goshen, Sakusaku's Cougar Go, Heikoku's Miyasama, Jen's Smoki of Rainbow. We have added these new bloodlines: Kari-On Doogie Houser, Timbersky Cessna Kao Kurai, Willowdeen's O'PR Akari No Inochi, Willowdeen's Kuma Yama Tosca, Windom's Imperial Strike Force. "The greatest companion you could ever have"
PUPPIES FOR SHOW AND BREEDING WITH FULL REGISTRATION $600 AND UP. PUPPIES FOR PETS AND COMPANIONS WITH LIMITED REGISTRATION $600 to 800 EACH.